She began dancing at the age of seven and entered the Martha Graham School of Contemporary Dance in 1956. Two years later she joined the Martha Graham Dance Company, in which she rose to become a principal dancer before returning to Japan in 1962 to work for Takarazuka. As well as being a choreographer, she was the most important dance teacher at the Takarazuka Music School. 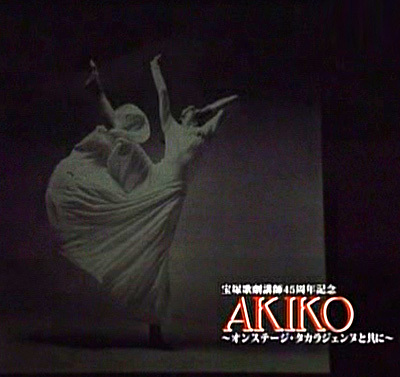 In 1984-85, a documentary was made about her dancing and her daily life, entitled Akiko: Portrait of a Dancer, and a book of photographs of her is also available. Novellist Sakaki Kunihiko (Kanda Kunihiko) is her son. Died of lung cancer on September 23rd, 2011, in Meguro ward hospital in Tokyo, being 75 years old. Despite of being severely ill, she continued performing until September 11th. Created by princesslucia. Last Modification: Sunday 17 of February, 2019 12:20:00 PST by caithion.